This short Winston Churchill Speech - Reply upon his award of Honorary Citizenship featured is in the form of a transcript, extract, passages or lines and demonstrates the good oratory skills of a great public speaker with the ability to use clear words and text. Speech Example Topic / Subject Type: Acceptance Speech. I have been informed by Mr. David Bruce that it is your intention to sign a Bill conferring upon me Honorary Citizenship of the United States. I have received many kindnesses from the United States of America, but the honour which you now accord me is without parallel. I accept it with deep gratitude and affection. I am also most sensible of the warm-hearted action of the individual States who accorded me the great compliment of their own honorary citizenships as a prelude to this Act of Congress. It is a remarkable comment on our affairs that the former Prime Minister of a great sovereign state should thus be received as an honorary citizen of another. I say "great sovereign state" with design and emphasis, for I reject the view that Britain and the Commonwealth should now be relegated to a tame and minor role in the world. Our past is the key to our future, which I firmly trust and believe will be no less fertile and glorious. Let no man underrate our energies, our potentialities and our abiding power for good. I am, as you know, half American by blood, and the story of my association with that mighty and benevolent nation goes back nearly ninety years to the day of my Father's marriage. In this century of storm and tragedy I contemplate with high satisfaction the constant factor of the interwoven and upward progress of our peoples. Our comradeship and our brotherhood in war were unexampled. We stood together, and because of that fact the free world now stands. Nor has our partnership any exclusive nature: the Atlantic community is a dream that can well be fulfilled to the detriment of none and to the enduring benefit and honour of the great democracies. Mr. President, your action illuminates the theme of unity of the English-speaking peoples, to which I have devoted a large part of my life. I would ask you to accept yourself, and to convey to both Houses of Congress, and through them to the American people, my solemn and heartfelt thanks for this unique distinction, which will always be proudly remembered by my descendants. This famous short Winston Churchill Speech - Reply upon his award of Honorary Citizenship is a great example of a clear address using excellent text to persuade and inspire the audience by a natural leader and motivator. Use this famous short transcript of the Winston Churchill Speech - Reply upon his award of Honorary Citizenship as an example of a great oration and clear dialogue. A Quote or extract from this short Winston Churchill Speech - Reply upon his award of Honorary Citizenship, provides an illustration of, or allusion to, the famous events the era. 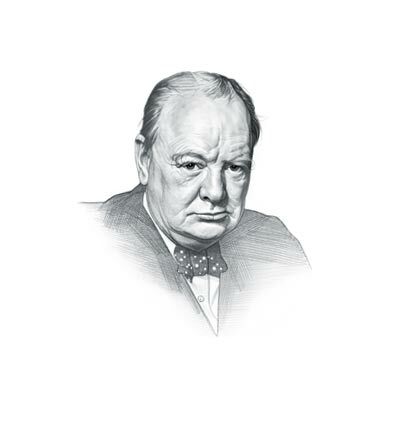 This famous short Winston Churchill Speech - Reply upon his award of Honorary Citizenship is famed for its powers of verbal communication making good use of the words and language to illustrate the subject. Whether this short address can be described in the category of powerful, persuasive, motivational or inspirational speeches the excellent powers of oration which are used makes it a famous short speech.